Bon Jovi is an American hard rock band from Sayreville, New Jersey. 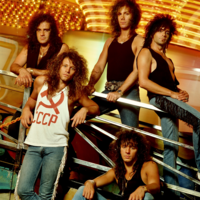 Formed in 1983, Bon Jovi consists of lead singer and namesake 'Jon Bon Jovi' (John Francis Bongiovi, Jr.), guitarist Richie Sambora, keyboardist David Bryan, drummer Tico Torres as well as current bassist Hugh McDonald. The band's line-up has remained mostly static during their history, the only exception being the departure of Alec John Such in 1994, who was unofficially replaced by Hugh McDonald. The band became known for writing several rock anthems, and achieved widespread recognition with their third album Slippery When Wet, released in 1986. After touring and recording non-stop during the late 1980s, the band went on hiatus after the New Jersey Tour in 1990, during which time Jon Bon Jovi and Richie Sambora both released successful solo albums. In 1992, the band returned with the album Keep the Faith. Their 2000 single "It's My Life", which followed a second hiatus, successfully introduced the band to a younger audience. Bon Jovi have been known to use different styles in their music, which has included country for their 2007 album Lost Highway. Their latest album, The Circle, was released on 10 November 2009 in the United States. Throughout their career, the band have released eleven studio albums, three compilation albums and one live album, and have sold 130 million records worldwide. They have performed more than 2,600 concerts in over 50 countries for more than 34 million fans, and were inducted into the UK Music Hall of Fame in 2006. The band was also honored with the Award of Merit at the American Music Awards in 2004, and as songwriters and collaborators, Jon Bon Jovi and Richie Sambora inducted into Songwriters Hall of Fame in 2009. On September 28, 2010, Bon Jovi was nominated for the Rock and Roll Hall of Fame, but on December 15, 2010 it was announced that Bon Jovi did not make it.